Let us aspire to the greatness our Founding Fathers imagined for us. Merry Christmas from Revolutionary War and Beyond! We hope that you are having a wonderful Christmas season with your family this year. Have you stopped this Christmas season to think about the privileges you have living in America? Where else on earth, or in the history of the earth, have any people been so blessed? Have you stopped to remember that our forefathers actually fought and bled, some giving the ultimate sacrifice, so that we could enjoy the freedoms that we have today? They not only fought, bled and died, they built a nation, giving us a form of government that would protect our liberties and encourage our prosperity. Their integrity, steadfastness, sacrifice and vision are things we can all look to for inspiration in our own endeavors. Today happens to be December 19th. 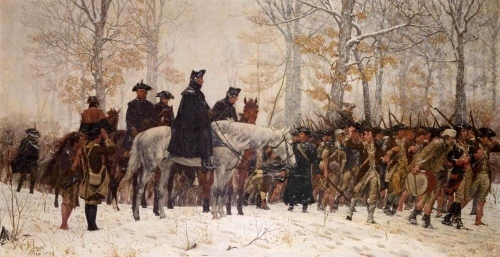 This is the 235th anniversary of the beginning of the Continental Army's winter encampment at Valley Forge. The army had suffered a series of defeats that brought despair to patriots across America during the year before. The cold winter brought with it food and clothing shortages, death and disease and an uncertain future that drove George Washington to his knees. But the harsh circumstances brought with them the entrance of light when Baron Friedrich Wilhelm von Steuben, a former member of the staff of Frederick the Great of Prussia, arrived. Von Steuben was a trained military officer and George Washington put him in charge of training the troops. Von Steuben developed a training system that quickly turned the army into a formidable fighting machine. In the spring, Washington attacked the British as they retreated from Philadelphia, drawing them to a standstill at the massive Battle of Monmouth and causing British Lt. Gen. Charles Cornwallis to retreat for New York in the middle of the night. This victory enthused Americans everywhere and proved that the Continental Army could truly stand against the most powerful military force in the world. If you are fighting your own "Valley Forge" of bleak circumstances today, look to the Continental Army's example by finding the light in the middle of your darkness. If you will look for it and be patient, you will find it. Isn't that what Christmas is all about? How still we see thee lie. What do you think caused this disorganized and undersupplied army to actually win the American Revolution? If you had faced the situation George Washington faced, would you have persevered as he did? What are the virtues that one would need in order to face these seemingly insurmountable circumstances and not give up? Do you have them in your own life?? Share your comments and answers to these specific questions on our Facebook page here. You can also follow our daily Facebook posts here. We have just started reading a new book called "Desperate Sons" by Les Standiford. 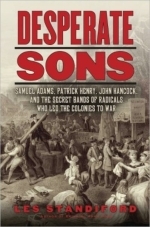 This is one of the only books that looks at the origin and history of the Sons of Liberty during and prior to the American Revolution. Did you know the Sons of Liberty arose during the Stamp Act crisis of 1765 and 1766? Colonists everywhere were upset when a new tax was placed on all paper goods, such as wills, contracts, licenses, newspapers, calendars, etc. The tax affected everyone and the anger was widespread. Leading citizens began to meet in secret to coordinate opposition to the Act. They wrote letters to the editor, organized communication with other colonies and planned protests, some of which turned violent. These groups began to call themselves Sons of Liberty and they helped stoke the flames that turned into an all out Revolution within a few years. If you would like to learn more about the book or read along with us (we post regular updates and discussion notes on the website), please go to our Desperate Sons page here. You can also learn more about the Stamp Act here. Who did Dorothy Quincy Hancock, wife of John Hancock, have a secret crush on while she was engaged to be married to John? We are NOT going to tell you where to find the answer on our site on this one! The answer is there, however! And look for the answer to the question here in the next issue! The last edition's Question of the Week was: How many people were killed at the Boston Massacre? The answer? Five, which many of our Facebook visitors guessed right away. You can read more about the Boston Massacre here. Have you visited a Revolutionary War site, such as Valley Forge, Boston, Philadelphia, Yorktown, Mount Vernon or the Liberty Bell? Share your experience and photos here! Our On This Day in History. posts have proved to be hugely popular. We started them in October of this year and post a new one each day. Each post tells about an event that happened on that particular day during the Revolution, leading up to the Revolution or from the early days of the new nation. You can follow the daily posts on our Facebook page here or on our Twitter page here. You can also go to our On This Day in History page here, where you can see all the daily posts. If you use an RSS reader to receive new posts from your favorite websites, you can sign up for our new posts using the orange RSS box in the left-hand column and you will receive the daily posts in your own RSS feed. 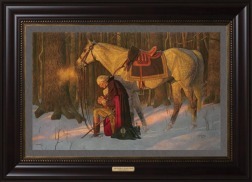 If you are still looking for that unique item for someone special for Christmas, you can order a Prayer at Valley Forge painting and still get it by Christmas, IF you order by noon Mountain Time on the 21st! Just click here to go to our Prayer at Valley Forge page. Patriotic Jewelry, including some really neat rings, flag pins, military watches and other red, white and blue jewelry. Patriotic Coins, including collector's items from the Franklin Mint and the Bradford Exchange. American Patriot's Bible, which shows the influence of the Bible on America's founding. Opus Americana, a book created by a United States Marine about America's heritage. and more, including a Revolutionary War chess set, patriotic stamps, American History magazine and a large selection of American flags. 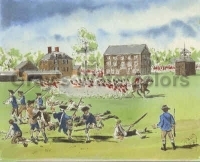 We recently added the American Revolution series from Gray's Watercolors. Gray's has produced thousands of unique American landscapes, landmarks and historical scenes since the 60s. We are privileged to offer their paintings on our website. Be sure to check them out. One of the unique things about the Gray's American Revolution watercolors is that many of them feature events that aren't the typical "big" ones that you always see. Some of the less well known events are depicted... and we like that! You can see all the Gray's Watercolors here. You can see all of our other patriotic books and gifts here. Advertise in this newsletter, or on our website, and be seen by people interested in the American Revolution - and beyond! If you're looking for something fun to do during your Christmas break, check out our Revolutionary War crossword puzzles. 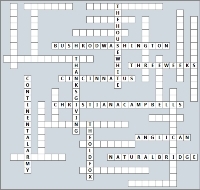 These crossword puzzles can be played online and the answers are all found on our website. For example, if you look at our George Washington Crossword, you will find that all the answers are found on our George Washington Facts page. We have put the links here to several of the crosswords. You can also print them off and solve them offline. And you can find even more at our Revolutionary War Games page. If you like these email newsletters, please forward them or share them with your friends! Thanks for reading American Beginnings with Revolutionary War and Beyond. Subscribe to this newsletter here - American Beginnings Newsletter.